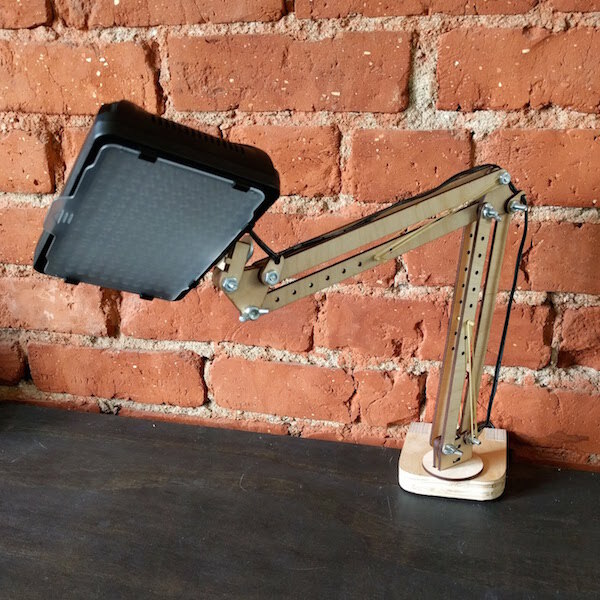 I started using an inexpensive video LED light for taking pictures and then I realized it doubled quite nicely as a desktop lamp. 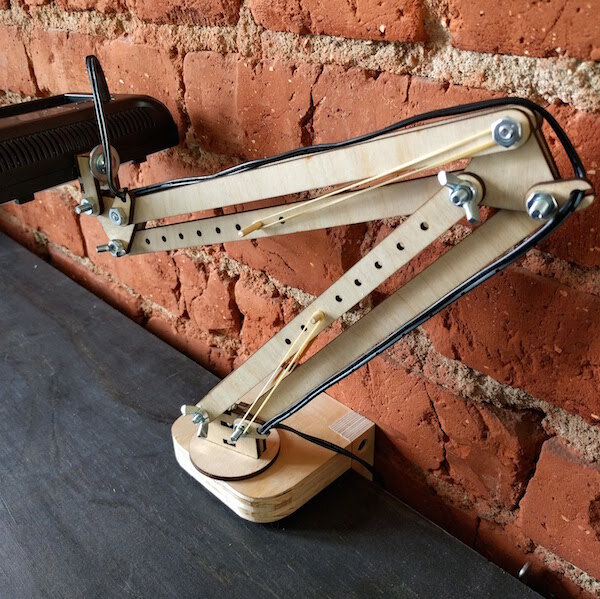 Adam Savage suggested something similar as a custom workbench lamp. My first attempt to make some arms was too simple and flimsy so I decided to replicate the classic design of the posable lamp base with materials I had at hand. I got some inspiration from a design by Matthew Phillips I found on Instructables (he also provides cut files if you wanna go that way). He used rubber bands instead of springs which I thought was pretty clever. I drew mine from scratch because I wanted a specific size and I had a bunch of #8-32 screws to assemble it. I also made a base that fit the needs of my current desk but I can see how this can be improved with some sort of clamp system. The base is made out of 3/4″ plywood and its wedged in between the wall and the desk. Rubber band for tension and wing-nuts to secure it when needed. I used #8-32 machine screws but I made the holes with a really tight fit to provide some extra friction. Where there are slots they were sized to the plywood I used and the kerf of my machine, so you might want to adjust that to your needs. My plywood was 0.125″ thick. The holes for the rubber bands are sized to the bamboo skewers I had at hand, so as with everything else your mileage may vary. It’s a simple design so I’m sure you can adapt it to your needs quite easily. There is a very similar version of this post on the glowforge forums in case you want to glean some extra wisdom from the community.